This post is about institutions and political leadership. There are two elements to this topic – institutions and leadership – but typically only one of them gets any attention – institutions. Here, I want to say something about both elements, beginning with leadership. What is political leadership? How should political leadership be defined? What is the ontology of political leadership? What does political leadership look like? How do we observe it? What behaviour constitutes leadership. What is behavioural political leadership? There was a great deal of discussion in the 1970s and 1980s about how best to define political leadership and there was no consensus answer. Currently, we have no agreed scientific definition. The question is whether we do not have such a definition either because as a political science profession we have all decided that there is no definition of behavioural leadership to be found, or because we have chosen not to look for one. However, recent work by scholars such as Cas Mudde on populism has shown us that the definition of difficult concepts can be made clearer. We may wish to revisit the debate about the definition of political leadership in this light. For example, if we define political leadership to include a normative component such as the idea that leadership as an essentially positive behaviour – along the lines of James MacGregor Burns – then leadership can only be a force for democratic good. From this perspective, behaviour that weakens democracy – by Orbán, Trump, Salvini, etc. – is, by definition, not an act of leadership, no matter how popular the behaviour and the people who are engaging in the behaviour may be. In other words, perhaps people such as Orbán and Trump are not really behaving as leaders. Perhaps they are not really exercising political leadership. We can only make such statements, though, if we have a working definition of the concept that can provide a scientific basis for making them. The absence of a definition of political leadership is a problem. There is now a genuine public and academic interest in the concept of political leadership. Yet, as academics, we have ignored the concept for many years. This means either that our work can safely be ignored because we do not have the scientific grounds on which to make any expert statements about the concept, or, worse, that we when make professional, expert, or academic statements about the exercise of political leadership in public, our work can be classed as mere opinion, as ideologically motivated comment, as fake news. This is because there is no science of political leadership. So, if we want to make statements about whether the behaviour of x or y leader constitutes the exercise of leadership, whether they are exercising good or bad leadership, etc, then we need some conception of leadership, some definition of the concept that is clearer than we currently possess. The study of institutions and political leadership is bound up with this discussion. In the absence of a consensus scientific definition of behavioural political leadership, as academics we have come to use the terms leader and leadership in a certain way. We have come to understand a political leader as anyone who holds a position of high political office – presidents, PMs, etc. Equally, we have come to understand political leadership merely as the actions of those people, whatever those actions might be, whatever their behaviour might be, however good or bad, right or wrong, they might be. The exercise of behavioural political leadership is not a specific, defined sub-set of the type of behaviour that presidents, PMs, etc engage in, it is any and all of their behaviour. We are perhaps missing something by thinking of leadership in this way, yet we gain something too. We lose the ability to make a Burns-like statement that someone such as Orbán or Trump is not really behaving as a leader. However, we gain the ability, first, to clearly identify the set of people – the leaders – that we are studying – presidents, PMs, etc. – and, second, we gain the ability to focus on any and all outcomes that we might happen to be interested in. That is to say, if leadership is not sub-set of the type of behaviour that presidents, PMs, etc engage in, but any and all of their behaviour, then we have the potential to study anything they do and say that we are studying leadership. The study of institutions is central to this positional way of thinking about political leadership. When political leaders are merely institutional office holders, then the study of political leadership is necessarily bound up with institutions in that regard. When leadership outcomes are any and all outcomes that we might happen to be interested in, then the study of political leadership is necessarily bound up with the institutional context in which leaders operate. To the extent that we assume different institutions shape behaviour in different ways, then thinking about leaders as mere office holders and leadership as merely the actions of office holders gives us the potential not only to focus on institutions and study empirically why leadership outcomes vary from one place to another, but also to make recommendations about what sorts of institutional changes might be made to generate better leadership outcomes. Thinking about leaders and leadership in this way, I want to make three empirical points about leadership and institutions. First, we have concentrated too much of our attention on leadership in the context of headline regime-level institutions – presidentialism vs parliamentarism. True, we can say with some assurance certain things about regime-level institutions. Samuels and Shugart have identified some discrete regime-level institutional effects. For example, in parliamentary systems leaders lose office for party political reasons more often than leaders in semi-presidential and presidential systems. However, in other areas we need to be much more circumspect. In relation to democracy as an outcome, the debate about institutional effects is much more unresolved than many people believe. The empirical results about the relative merits of presidentialism and parliamentarism for democracy are sensitive to case selection, time period, model specification, etc. We have to acknowledge that many factors affect democratisation. Institutions are only one. Second, this does not mean that institutions do not matter. However, we need to move beyond the study of headline regime-level institutions and look at how individual institutions combine to generate leadership outcomes. Institutions can combine to open up space for individual leaders to govern in a personalised way. They can also close down that space if they are designed appropriately. Indeed, institutions in parliamentary and semi-presidential regimes can combine in similar ways to generate similar leadership outcomes, opening up or closing down space equally. For example, a Hungarian-style parliamentary system with an electoral system that encourages a coherent single-party majority that supports the PM creates the potential for personalised PM leadership. Equally, a French-style semi-presidential system with an electoral system that encourages a coherent single-party majority that supports the president creates the potential for personalised presidential leadership. The Samuels and Shugart thesis still applies. In Hungary the party could still bring down the PM whereas in France the party in parliament cannot bring down the president. Typically, though, the institutional design of both countries has opened up the space for both the Hungarian PM and the French president to govern in a personalised manner. What allows the French and Hungarian systems to be so personalised is not the regime-level structures. It is the combination of the type of electoral system, the process of judicial appointments, the rules governing the organisation of political parties, the constitutional powers of the president and PM, and plenty of other institutional features too. In other words, the space that is opened up or closed off to top-level leaders is a function of the combination of many discrete institutional features. When we study institutions and political leadership, we need to look at the combination of these discrete institutional features, rather than merely the headline regime. Third, this means that we also need to study these discrete institutional features in themselves. If we are worried about how leaders can abuse institutional features, then we need to look at all institutions and how they can be abused by leaders who want to engage in personalised leadership. For example, what is the power of a president to dismiss a constitutional court justice, or to prevent a PM from dismissing a constitutional court justice? This is far from a top-level, regime-defining institutional feature, but it can be an essential element of whether there is democratic backsliding in a country or not. We know from work on democratic backsliding that would-be authoritarian leaders will use any institutional feature to try to get what they want. We have to be mindful of how any institution can be used and abused. We have to be mindful of how any of those discrete institutional features can combine with each other to create a potentially difficult situation for democracy. We have to move away from the study of just presidentialism or parliamentarism and think about institutional features more generally. 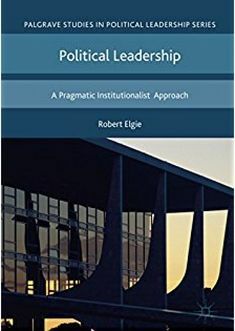 To go back to the beginning, it is important to realise that there are two elements to the study of institutions and political leadership – institutions and leadership. What this means is that when we study institutions and political leadership, we have to do two things. We have to study institutions. We have to study how the effects of institutions. We have to study how those effects can be used and abused. We have to think about institutional reform and how we can generate better leadership outcomes. But we also have to think about the concept of political leadership itself, or at the very least we have to think about whether we want to think about the concept of political leadership. What behaviour constitutes political leadership? If we have an answer to that question, then we can start to explore which institutions correlate with behavioural political leadership. This would certainly be a step forward in the study of institutions and political leadership. This is a revised version of a presentation that was given on 27 September 2018 to the German Political Science Association conference at the Goethe-Universität Frankfurt. The theme of the roundtable was Political Leadership in the Age of “Post-truth Politics” – Potentials and Risks?”. This entry was posted in Presidentialism and parliamentarism and tagged institutions, Political Leadership on October 24, 2018 by Robert Elgie.